There is little empirical evidence that specialised banks are less stable or perform worse, as suggested by standard portfolio diversification theory. This column uses new data to argue that more specialised banks between 2002 and 2012 did not perform as theory would suggest. More specialised banks, and banks with similar sectoral exposures to their peers, suffered less volatility and had lower exposure to systemic risk. The lack of post-crisis regulatory reform in this area may, accidentally, have been a good thing. What is the value added of banks? Concentration of bank assets is one of the most important factors contributing to systemic banking risk. According to a 2004 Basel Committee study, credit concentration in banks caused nine of the 13 major banking crises around the world in the 20th century (Westernhagen et al. 2004). Bank asset concentration also contributed significantly to the two major banking crises of the 21st century so far – the simultaneous overexposure of several banks to the US mortgage market that created the Global Crisis 2007–08 (Brunnermeier 2009), and exposure to the sovereign debt of distressed European countries that severely deepened the European crisis of 2011–12 (Acharya et al. 2015). Given the critical role of risk concentration in banking, it is surprising how little empirical evidence is available, although this can be explained by a lack of data. In recent work, we introduce a new methodology to measure sectoral specialisation and differentiation and relate them to bank performance and stability (Beck et al. 2017). Theory has provided contrasting hypotheses on the relationship between specialisation and bank performance and stability. On one hand, traditional portfolio theory view argues that diversification largely eliminates the impact of idiosyncratic shocks on a bank loan portfolio (Diamond 1984, Boyd and Prescott 1986). Therefore, more specialised banks should be less stable and – at least in the long run – perform worse. On the other hand, (sectoral) specialisation can also result in lower information frictions between banks and borrowers. Better monitoring skills can prevent risk-shifting by borrowers, as described by Stiglitz and Weiss (1981). Therefore, the superior expertise of more focused banks may imply lower default risk among their borrowers and also enable them to detect a deterioration in the borrower's business earlier, allowing them to mitigate risk in a timely manner – for example, by requesting additional collateral (Winton 1999). This leads ultimately to higher (risk-adjusted) returns. Sectoral concentration, however, matters not only at the level of the individual bank, but also in comparison with other banks in the system, as the degree to which banks specialise in the same sectors might affect their performance and stability. The banking system has become increasingly homogeneous in recent decades, and this has happened only partly through increasing consolidation (De Nicolo and Kwast 2002). This lack of diversity is potentially more costly for society as it implies that similar institutions will more likely face problems at the same time (Wagner 2010). Banks may have ex ante incentives to become more similar through herding, which can lead to socially undesirable outcomes (Acharya and Yorulmazer 2007, 2008). Most papers testing these hypotheses have relied on credit registry data for one country, which limits the external validity of the findings. Also, sectoral concentration of banks does not occur only through lending, but can be critically influenced by the use of derivatives either to hedge positions taken through lending, or to create long or short positions in specific sectors. We develop a new methodology to take a broader view of sectoral exposures. It allows researchers to identify the strategic choices that banks make with respect to their sectoral concentration, and then apply this methodology to a sample of 1,587 banks across 24 countries between 2002 and 2012. Specifically, drawing on research into mutual funds, we use an extended factor model and relate bank stock returns in a given year to returns on nine sectoral portfolios and a set of common factors. These factors include the returns on a global market index, a domestic market index, a financial sector index, a real estate index, and the Fama-French factors. We test whether banks were well diversified (meaning that their returns were only exposed to a set of common factors) or whether banks were specialised (meaning that their returns exhibited significant exposures to sector-specific portfolios above the set of common factors in the model). We define bank sectoral specialisation as the percentage variation of the bank's stock returns that is incrementally explained by sector-specific portfolios above the variation explained by the set of common factors. We then define bank sectoral differentiation as the Euclidean distance between a bank's estimated sectoral exposures and the average sectoral exposures of all other banks in the same country and year. While the average specialisation was 3.4%, it ranged from less than 1% to 7.2%, indicating that there was large variation in the degree to which markets perceived banks to be over- or under-exposed to specific markets. Note that this additional sectoral exposure can be both positive and negative, as banks were able to create short positions in specific sectors through derivative positions. Differentiation ranged from 1.1 to 4.5, with an average of 1.6. Figure 1 shows the mean and the 25th and 75th percentiles of our specialisation and differentiation measures for our sample. 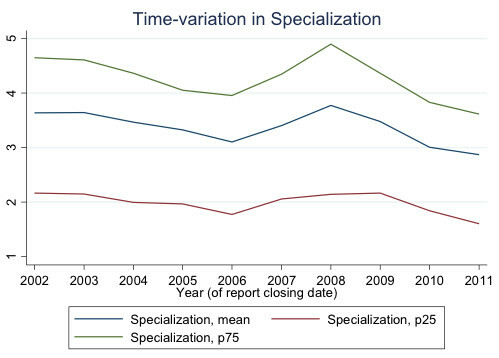 Specialisation, as measured by return-based data, decreased in the years leading up to the global crisis, increased until 2008, and decreased afterwards. 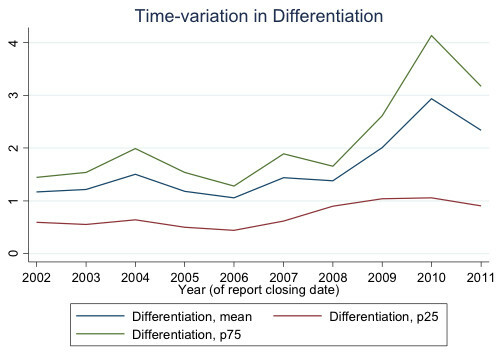 Differentiation varied little until 2008, when the mean and 75th percentiles suddenly more than doubled, before falling back after 2010. We gauge the validity of these market-based measures of specialisation and differentiation by comparing them with a small hand-collected database on the sectoral lending exposures for a subsample of the largest banks, derived from annual financial reports. Using this subsample, we can show that our new measures of sectoral specialisation and differentiation show both statistically and economically significant correlations with account-based measures of sectoral specialisation and differentiation, respectively. We are also able to show important variation in this relationship across banks, depending on their use of derivatives (as captured in the size of off-balance sheet items relative to total assets) and in the transparency of their financial statements. Even though our estimates of sectoral exposures do not necessarily measure concentration of banks' sectoral loan portfolios (as our estimated exposures might also have reflected non-lending exposures through holdings of securities or the use of derivatives), the strategic concentration choices that are uncovered by our methodology relate meaningfully to observed concentration in their loan portfolios. Finally, we relate these market-based indicators to three indicators of bank performance and stability. Specifically, we focus on the volatility of bank stock returns to measure idiosyncratic volatility, the market-to-book value of its equity to gauge risk-adjusted returns, and the marginal expected shortfall to capture the exposure of a bank to systemic risk (Acharya et al. 2017). Banks with more concentrated sectoral exposure experienced a lower volatility in their stock returns and a lower exposure to systemic risk. There is also weak evidence that more specialised banks had higher franchise values. The long-run effects are substantially stronger than the short-run effects. These results are statistically and economically significant. 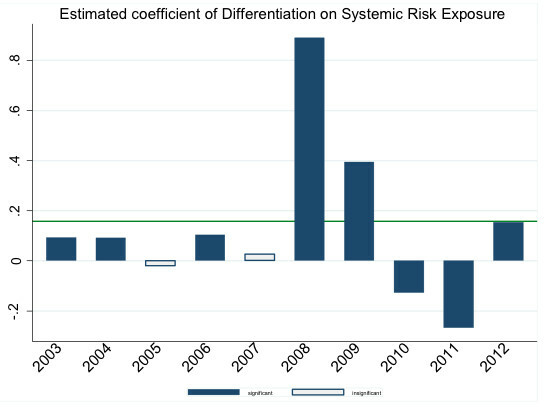 In the long run, a one standard deviation increase in sectoral specialisation reduces total bank risk by 0.2 standard deviations, and reduces exposure to systemic risk by 0.32 standard deviations. Banks whose sectoral exposures are similar to that of their peers in the same country and same year experience lower volatility and lower exposure to systemic risk. This result is particularly driven by the crisis years 2008 and 2009. These findings are consistent with theories focusing on the benefit of sectoral specialisation for reducing idiosyncratic and systemic risk (e.g. Winton 1999) but not with theories that focus on the benefits of portfolio diversification (such as Diamond 1984). 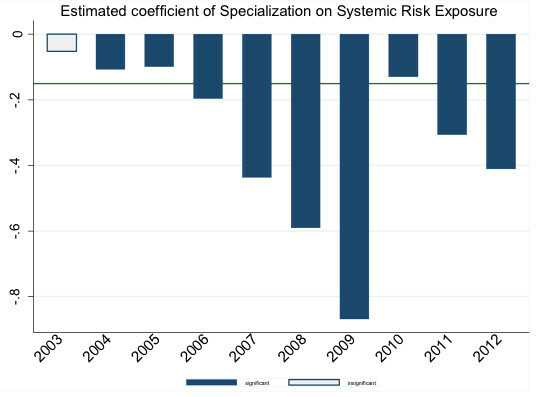 Note that the benefits of sectoral specialisation are primarily risk reduction rather than an increase in value. That is to say, markets perceive more specialised banks as less risky, including during systemic shocks. Although at first sight the results do not seem to be consistent with theories focusing on the risks of similarity of banks’ exposure profile (Acharya and Yorulmazer 2007 and 2008, Wagner 2010), they might actually reflect underlying market expectations of bailouts if there are ‘too many banks to fail’. Alternatively, adverse market reaction to more differentiated banks (especially during systemic shocks) might be due to higher information asymmetries of investors vis-a-vis banks that look very different from their peers. We also explored the time- and country-variation of these relationships (Figure 2). 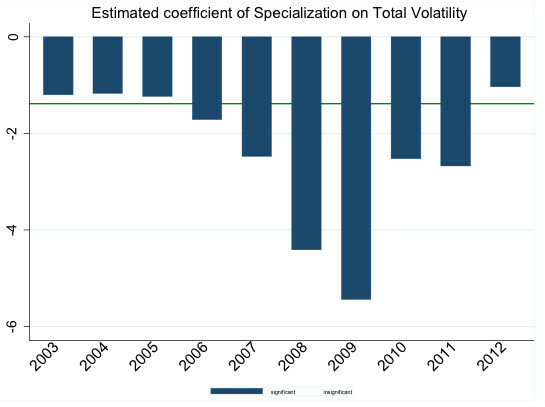 The negative relationship between sectoral specialisation, and stock volatility and exposure to systemic risk was significant throughout, though stronger during the crisis years. 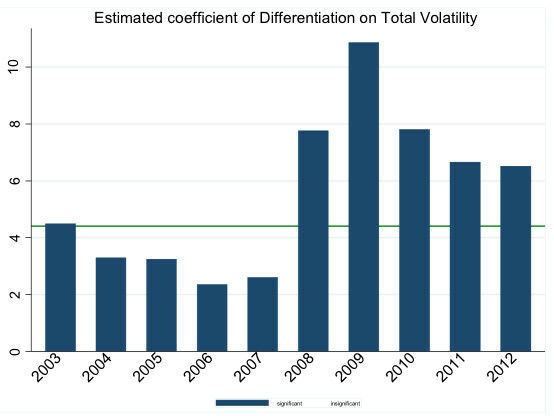 Similarly, the positive relationship between differentiation and stock volatility became stronger after the crisis, while the positive relationship between sectoral differentiation and systemic risk exposure was driven by the crisis years. The relationships between sectoral specialisation and differentiation on one hand, and bank performance and risk on the other, exhibit time-variation – and there was also substantial heterogeneity in these relationships across countries. The wave of regulatory reform after the Global Crisis has not addressed the issue of sectoral specialisation and differentiation. Our research implies that this might have been a good thing, as performance and stability of more specialised banks did not necessarily correspond to standard theories of portfolio diversification. Our findings show that more specialised banks suffered less volatility and lower exposure to systemic risk. The same applies to banks in the same country and year with similar sectoral exposures to their peers. We also find country variation in these relationships, however, which makes the design of one-size-fits-all regulation on sectoral exposures impossible. Acharya, V V, L H Pedersen, T Philippon, and M Richardson (2017), “Measuring systemic risk”, The Review of Financial Studies 30 (1): 2-47. Acharya, V V and S Steffen (2015), “The greatest carry trade ever? understanding eurozone bank risks”, Journal of Financial Economics 115: 215-236. Acharya, V V and T Yorulmazer (2007), “Too many to fail? An analysis of time-inconsistency in bank closure policies”, Journal of Financial Intermediation 16(1): 1-31. Acharya, V V and T Yorulmazer (2008), “Information contagion and bank herding”, Journal of Money, Credit and Banking 40(1): 215-231. Allison, P (2009), Fixed effects regression models, Thousand Oaks, CA: Sage. Beck, T, O De Jonghe and K Mulier (2017), “Bank sectoral concentration and (systemic) risk: Evidence from a worldwide sample of banks”, CEPR Discussion Paper 12009. Boyd, J H and E C Prescott (1986), “Financial intermediary-coalitions”, Journal of Economic Theory 38 (2): 211-232. Brunnermeier, M K (2009), “Deciphering the liquidity and credit crunch 2007-2008”, Journal of Economic Perspectives 23(1): 77-100. De Nicolo, G and M Kwast (2002), “Systemic risk and financial consolidation: Are they related?”, Journal of Banking and Finance 26(5): 861-880. Diamond, D W (1984), “Financial intermediation and delegated monitoring”, Review of Economic Studies 51(3): 393-414. Stiglitz, J and A Weiss (1981), “Credit rationing in markets with imperfect information”, American Economic Review (71): 393-410. Wagner, W (2010), “Diversification at financial institutions and systemic crises”, Journal of Financial Intermediation 19(3): 373-386. Westernhagen, N, E Harada, T Nagata, B Vale, J Ayuso, J Saurina, S Daltung, S Ziegler, E Kent, J Reidhill, and S Peristiani (2004), “Bank failures in mature economies”, Basel Committee on Banking Supervision Working Paper 13. Winton, A (1999), “Don't put all your eggs in one basket? Diversification and specialization in lending”, Wharton School Center for Financial Institutions Working Paper 16. Wooldridge, J (2010), Econometric analysis of cross section and panel data, MIT Press.